Japanese Episode DP 002: "Search for Pikachu! Route 202!" American Episode 466: "Two Degrees of Separation!" 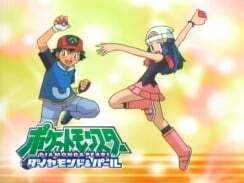 Having just received her first pokemon from Nanakamado-Hakase, Hikari sets off to compete in the Super Contest in Kotobuki City. 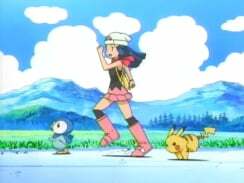 Though she encounters a number of wild pokemon on the way, she is unable to capture any of them. Suddenly, she hears a rustle in the bushes and sees an injured Pikachu! She tries to capture the pokemon, but when her Monster Ball rejects the capture, she realizes that it must already have a trainer. Suddenly, Musashi, Kojirou, and Nyasu of the Rocket-Dan appear to retrieve the electric pokemon! At first, Hikari believes the trio when they tell her that Pikachu belongs to them, but before long she determines that they're lying. 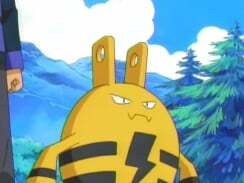 Hikari and her Potchama stand up for Pikachu and help it send the Rocket-Dan blasting off again, but the battle wears out the electric pokemon. 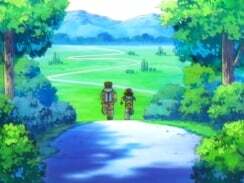 Hikari takes the injured pokemon to the nearest Pokemon Center, where she tells Nanakamado-Hakase what happened. Elsewhere, the Rocket-Dan stumble across one of Kojirou's summer getaway houses and discover that the blue-haired member of the team has a Muscippa! 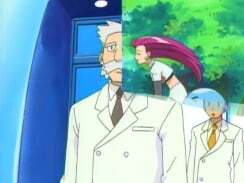 Meanwhile, Satoshi is found by Junsa, who takes the young trainer to Nanakamado-Hakase's lab. 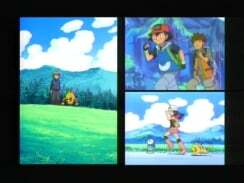 There, he tells Satoshi about the young girl who found his Pikachu, so he gets on Route 202 to meet her. Along the way, he runs into his old traveling companion Takeshi! 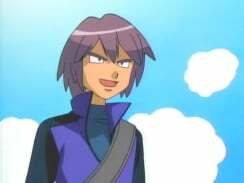 Satoshi tells his friend about what happened to Pikachu, so the Nibi City Gym Leader decides to join Satoshi on his journey. 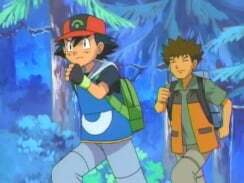 Along the way, Satoshi captures a Mukkuru to help him search for his pokemon by air. 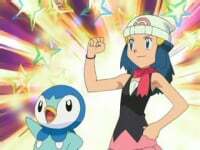 Now that Satoshi has a new traveling companion and a new pokemon, the search for Pikachu can continue! This episode is alright, I guess. Takeshi's re-entry into the group is kind of lame (as is his presence in Diamond & Pearl, to be honest), and Kojirou just conveniently finding a Muscippa is way beyond believable, even for this show. But there are a number of good things to say about it. The episode actually makes us care about whether or not Satoshi finds his pokemon, and I like his honesty when he says that he's catching Mukkuru just to find his Pikachu. Would've been nice if you were that honest to your Pigeon, Satoshi. Sakaki's previous voice actor in the Japanese version, Suzu'oki Hirotaka, passed away a little over a month (August 6th, 2006) before this episode aired on Japanese TV, so he was replaced by Miyake Kenta. Mr. Miyake had done a number of voices previously (Satoshi's Donphan, Dome Superstar Heath, etc.) and does a pretty decent job of imitating Suzu'oki's voice, so if the character ever appears again, we know he'll be in good hands. One thing I noticed about the dub is how inappropriate the dialogue is. I noticed how a lot of the characters, especially Dawn, just don't talk the way real kids do. Everything has this cynical feel to it, and it feels more like the characters are adults who are sitting back and commenting on the action rather than little kids in the middle of it all. This isn't anything new for the dub, but for some reason, it stuck out to me a lot more during these initial episodes. If the way the commercial breaks in this "movie" is any indication of when the actual episodes begin and end, then the second English episode is made up of all of the the second Japanese DP episode and the first three and a half minutes or so of the third DP episode. 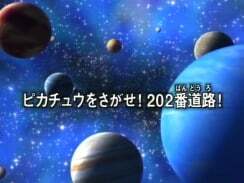 Which means that the third English episode is made up of the remaining sixteen minutes of the third Japanese episode. Like I've said before, I'm sure it'll all be ironed out once the actual episodes air, but I thought I'd mention it anyway. Persian keeps its Japanese voice. The title screen gets snipped for the second episode in a row. I'm sure it'll be restored once these three are aired as regular episodes. Because of the way the commercial breaks are placed, a little scene transition gets cut from the dub. The eyecatches add Satoshi, so I'll go ahead and post pictures of it now. You see how Satoshi is played up as being more of a secondary character? James: "You see? Victreebell's not the only pokemon who likes to take a nip at my noggin." Oddly enough, this line isn't in the Japanese version. Kojirou just laughs and talks about how happy Muscippa is to see him. While PUSA's inclusion of a little continuity is nice, it's not a translation of the Japanese line. Also, the scene with Sakaki in it is all kinds of mistranslated. In the dub, Giovanni acts like he's annoyed with the trio and talks down to them because of the way they've bumbled things in the past (and then says he doesn't know who they are? ), but in the Japanese version, Sakaki has this hilariously blank attitude throughout the entire conversation. You genuinely get the feeling that he has no clue who he's talking to as he tells them to "do their best" in the most generic tone possible. Just like in the last episode, this episode had the last bits cut to make everything flow more like a movie. What's important about these shots is that American viewers miss the true debut of Shinji. So both Shinji and the narrator get some of their lines taken away from them in the dub? Ouch.